About a decade ago I watched a giant front-end loader pull a metal culvert that was restricting fish passage out of a steelhead stream in Southern California. It was fun to watch and gratifying because my organization at the time had a hand in making it happen, but I did not for one second think that front-end loaders in streams were always good for fish. I suspect being part of a discipline like ecology that has a lot of special rules and exceptions helps with this type of discernment. I wonder if suction dredge miners have this same discernment “chip” or if they hope others do not. 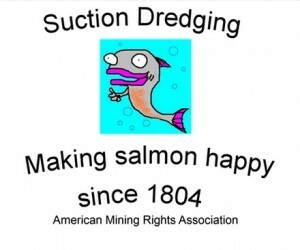 The reason I raise this issue is that dredgers seem to be promoting the notion that because suction dredges are occasionally used to clean gravel beds in waterways hopelessly choked with silt or to move materials quickly, that suction dredgers and dredges are actually good for fish. One example that at least one miner is using to seemingly prove this point is his participation in an impressive restoration project on the East Fork of the Lewis River near Vancouver, Washington (see above from Northwest Mineral Prospectors Club facebook page). This project was undertaken by Friends of the East Fork who are really doing some incredible work to restore chum salmon and other salmonid runs in fish-poor wastelands created by gravel mining and other activities. While I would like to commend suction dredgers for the work of some dredgers to restore streams and rivers, that does not balance out or change the fact that they are doing much more damage at other times. (The above poster of this Facebook story, for example, neglected to mention his Hydraulic Project Approval permit issued in 2009 to move up to 50 cubic yards of material in the same waterway system). Can suction dredges be an effective tool for fish habitat restoration? Yes in rare instances, but the same can also be said for dynamite, front-end loaders and other agents of destruction. Suction dredgers are also quick to crow about how much lead they remove from waterways as a rationale for their presence on the water. This too is not as it seems. While lead is certainly a huge problem for birds while it remains mixed with the surface materials and accessible, legacy lead—older lead that is buried—is not as serious a problem once it sinks beyond the reach of birds. With the banning of lead shot for waterfowl hunting in 1991 and awareness in the fishing community about the dangers of certain lead devices, "new" lead in the system has been greatly reduced and the rest continues to do what lead does best: Sink. Therefore, claims of massive amounts of lead recovered by suction dredgers has less to do with environmental benefit and more to with massive amounts of materials moved and damage to waterways and streambeds. 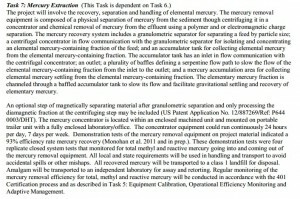 Another of the “benefit myths” promulgated by suction dredgers and probably the most complicated is the one dealing with mercury removal. We all know that mercury contamination is an important environmental issue and that gold miners polluted waterways with this toxic metal during gold rushes of the past. While it is commendable that suction dredge gold miners want to remediate the sins of their predecessors, the question remains: Are they best equipped to do it? And when that question has been asked of experts, the answer given is: No. Gravel and cobbles that entered the sluice at high velocity caused the mercury to flour, or break into tiny particles. Flouring was aggravated by agitation, exposure of mercury to air, and other chemical reactions. A study conducted in 2005 that examined the removal of mercury by suction dredges found that the dredges removed 97% of the elemental mercury. This is the finding that the suction dredgers tend to focus on and promote. But there is a "Paul Harvey" moment here too, and that is that the discharge from those dredges would be considered a toxic waste and contains “floured” mercury which is mercury that is easily transformed into a biologically harmful form and transported in the river current. An independent review of the 2005 study reinforced the findings and said that the peril described was conservative. The basic message being that it is better to leave the mercury where it is and undisturbed than to try and remove it with recreational suction dredges. 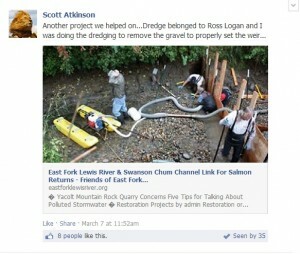 Now suction dredgers—wanting to confuse the issue—have claimed that a proposal to remove mercury from Combie Reservoir in the foothills of the Sierra using modified suction dredges for sediment acquisition proves that suction dredgers should be allowed to perform this “service” and they see this as equivalent to their actions. My only possible and appropriate response is: Poppycock. 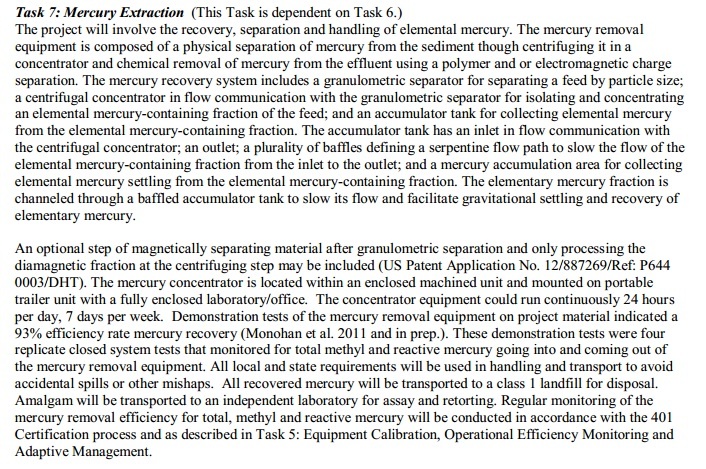 The proposed Combie project protocol takes the water and sediments, and pumps them into what is essentially an onshore laboratory which uses centrifuges to extract elemental mercury (see above excerpt from Combie plan). Then the remaining materials are subjected to sophisticated magnetic and chemical treatments, before being sent to the equivalent of a high-tech sewage treatment facility with frequent testing happening at every step of the process. Comparing recreational suction dredge mining with the above process is about as appropriate as comparing an abacus with a modern calculator. The last related myth we see is that some are arguing that suction dredging mimics natural processes like storm events and what suction dredgers do is no different than what nature does. There are obvious problems with that in terms of timing and magnitude. Our salmon have evolved over the years to make the best use of fluctuating, but fairly predictable cycles of rain, snow melt and dryness. The lifecycles and life stages of these fish are dependent on these cycles. Suction dredges inject disturbance during a time when these systems are least able to deal with disturbance. The magnitude issue is a little more complicated. Winter storms bring massive changes to rivers, streams, and other waterways. These seem absolutely chaotic and without pattern or purpose, yet they also leave significant elements and often those are gravel beds and riffles that have become “armored” by a complex combination of cobble, gravel and silt over time. Suction dredging disassembles these structures and redeposits the constituent parts in tailings that are more likely to be scoured from the streambed. While this may be characterized as trivial in the big picture view of rivers and tributaries, when you are dealing with endangered and challenged fish, actions that cause or are likely to cause redd failure cannot be allowed or enabled. People who love an activity are very resistant to being told that it causes problems. Because of that, a system of myths has been developed by those who want to feel good about their actions or who gain economically from the continuance of the activity. Unfortunately, for the former, these myths are simply not supported by science or experience. Good stuff in this post, Bob. Thank you. More bs from the master of it himself. So did I miss any of the myths that you have raised in your video? Please let me know and then I can cover them. the key words here are potential, if, could…ect. This report is made up of nothing but what could happen, in effort to dicredit the report of what does happen. In every trial the accuser holds the burden of proof. Science–in this particular application–is all about determining risk and probabilities. We (and I am a scientist) tend in this context to talk in terms of “could” or “can” rather that “will” because we know there is a small, offchance that it will not. The point is that we as a group are very careful not to overstate findings and we should exercise caution in this regard. We are also a group that rightfully draws conclusions from synthesizing a body of literature to try to assess what is likely to occur. These comments are important to examine but then so are statements by professional groups like the American Fisheries Society (AFS) that look at all the science and then make recommendations. Scientists tend to say things like “in my considered opinion” like fisheries biologist Dr. Moyle has on occasion, because they have considered all the information available before making a statement. That is why this myth of “unsettled science” generated by a suction dredger with a scientific background bothers us so much. This is where your argument comes from and this gentleman knows better (see http://www.cascwild.org/western-mining-alliance-and-brain-surgery-by-dentists/ under the heading of unprofessional behavior). He and his colleague are also the ones that have forwarded much of the misinformation about the “findings if no significant impact,” which wildly mischaracterize the nature of those findings and exactly what they actually mean (see: http://www.cascwild.org/fonsi-not-fonzie/). I am all for lively debate but we need to be honest and we need to understand why some types of language are used and where. I spent nearly a decade assessing ecological impacts for a number of projects and you have to read these documents to understand where the risks are and how cautious we have to be. Moreover, when you look at the conditions recommended within FONSI we regularly see violations of those conditions on YouTube and on other places on the web. And in terms of your trial analogy,that does not apply to endangered or vulnerable species otherwise we lose them. If we strongly suspect there is a risk then we need to exercise caution. We have communicated directly and you have expressed to me a desire for honest and forthright communication, I agree with that. Yet you were also a witness last weekend to the head of the American Mining Rights Association calling me a coward, liar, and commie as well as inferring that I was writing from jail and missing some important and cherished parts of my anatomy. His original argument being that I did not have the “gumption” to visit his facebook page and debate him. I came and started a fact-based argument that included questions about why he inferred that I was in jail and why did he make the weird claim on video that people in Oregon would need to go through an environmental impact process to plant tomatoes on their private lands if they lived near a river that was designated under the state Wild and Scenic program. Others joined the debate including you on a similar insult ladened thread and then suddenly all my responses dissappeared as well as others that asked similar questions, yet the taunts and the insults remained. Now you come from the suction dredging camp, but how do you reconcile Shannon Poe’s behavior? Are his actions those of an honest broker and dispenser of truth? I would like to read any research that has been done which provides signifgant evidence of the negative impacts caused by suction dredging… Any chance you could e-mail me links or documents of such research? I have done that repeatedly throughout my comments on this blog and elsewhere. Please use our search function and use the term “suction dredge.” Since you also post on AMRA, I would suggest that you read my post on AMRA. I do not see such links to anything that seem creditable of course I am getting old so I may have overlooked some. A review of a study does not conclude anything nore does an opinionated website. One link states that you have to purchase the full text. Actual studies should be public domain so that anyone can draw a conclusion based on factual and impartial data. 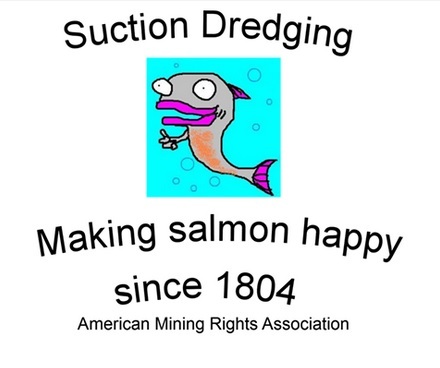 I am a miner and also an AMRA member but I have never suction dredged before. I am also very much against anything that has a substantial impact on the enviroment so I try very hard to look at facts… I have read most of the studies provided by mining rights advocates that do in fact seem to concluded that it does not have a substantial impact. Since you are on the other side of an issue that I am very much interested in and you seem knowledgable enough I would like to see actual studies that support what you are fighting for…. I'm a man of reason and I am not calling you out for a debate, I am just trying to understand the issue in it's entirety..
Abstracts lead you to papers that should be available in full text at most university libraries. These are, for the most part, peer reviewed artlcles. That is where most of us view these documents when we are doing our research. The lead issue is a complicated one as it comes from many sources and the impact and remedies are therefore varied. No backing off of the issue at all. Lead shot, fishing weights and bullet fragments all have different lifecycles and routes of ingestion. We are not in favor of lead use in any of these products but the risk posed by deeply buried fishing weights in river sediments is much, much less than bullet fragments in offal left after field dressing a deer–one is available to birds and the other not so much.